Is it possible to add D3D11as a hardware acceleration decoder choice for lavfilters for use with madvr? Edited by ausvette, 22 December 2017 - 09:27 PM. Edited by Doofus, 22 December 2017 - 09:54 PM. I'm talking aboout the lavfilter decoder settings. I would like a setting which allows selection of D3D11 in the lav filters. It looks like you're trying to use LAV filters that you installed, yourself? If that's the case, Theater has it's own LAV filters, and their settings aren't exposed, as MadVR is being used. Also, the options in the UI, are meant for mpv, not LAV or MadVR. Are you using the MadVR option in Theater? Yes. Theater runs, madvr and lav filters startup. The lav filter settings however do appear to be controlled from theater. I can make any changes I want while theater is running, but next time I watch a video they're reset again. That is unintentional. On my system, the tray icons are present but can't be used. They used to be hidden. This is intentional. LAV has never been given access to. The Theater UI settings are for mpv. Before mpv was introduced, many people made your request, and it was never granted. And in the initial switch over, directshow filters were removed. I'm just trying get you to understand that the directshow filters are only present because there are people who really want to use MadVR. They are trying to limit all the troubleshooting that exposing those settings can incur. Out of curiosity, when you 'enable' D3D11 in LAV, how do you know it's actually being used? I have no access to LAV at all. I see the icon in the sys tray, but I can do nothing with it. No info or anything. With newer versions of madvr and newer versions of lav filters, choosing the new D3D11 hardware decoder in lav filters enables 10bit fullscreen windowed mode. With other decoders full screen exclusive mode is needed for 10 bit. Is there a way to get emby theater to stop changing this setting? I have been using Emby for many years since it was mediabrowser as an add on to wmc. I have 2 emby server premiere licenses. One on a portable system I use for traveling and the other at home. At home, I have a 65" HD tv which I'm quite happy to use emby theater with internal player and basic configuration. I also have a 8 seat dedicated home cinema, sound treated, light treated, 150" anamorphic cinemascope 3D 4k projector setup with screen masking. On this system I want the absolute best picture quality possible. I've been running mpc-be on that system with madvr and lavfilters upscaling to 4k and 3d playback for nearly 2 years. Was all good till about 6 months ago when emby theater started locking up after watching a video with mpc-be. Video would play perfectly, but after closing emby theater was frozen. Last 6 months I've been trying to come up with a work around I can live with. I tried kodi and the emby for kody addon. Plays mpc-be with madvr as I want perfectly. But seems if you use an external player with kodi then Emby doesn't update the watched status. Which I think is a must have feature. Otherwise was a good work around for me. So back to emby theater. Ok so most of what I watch is 2d. So I've changed the 2d stuff over to the internal player with madvr. But I want to run later version of madvr and lav filters. Seems to be working ok. Except Emby theater keeps resetting the hardware decoder. So looking for a solution to this. On the 3d side, I tried latest version of powerdvd. Set that up as an external player. Result is movie plays perfectly but after exiting powerdvd, emby theater is frozen. So I don't have a solution for 3d yet, But thats more like a once a week thing. So at the moment I'm putting up with that and restarting emby theater after watching the movie. Stupid thing to have to do. But thats all I have at the moment. Its great that emby has a neat internal player, but it is pretty limited, it doesn't have all the features madvr offers, it isn't easy to configure like madvr, it doesn't do 3d and from what I read getting uhd rips to play is problematic at best. Would be nice if an option was retained for more advanced users to be able to launch a extenral player of their choice without having emby theater throw a sulk and freeze up. I realize no-one else seems to have the exact same problem I do, but I read of people having various other problems trying to do more advanced things with the internal player and odd issues with external players. The option is retained to use an external player. Luke would need to release that. Right now, those settings a set internally, and there isn't a way for us to override that. Luke has a test build in which he's made a change to how the Theater window, operates. That might help with the locking up. The MadVR UI in this build isn't working correctly, so you'll need a keyboard to navigate. When playing, the back arrow is not visible, but you can use the backspace key. And you'll need to update LAV and MadVR. If you're interested, I've been testing playback of HDR10 in mpv, and have had good results. Here's a link to the test build with an updated mpv.exe. I'd appreciate your opinion on how well HDR10 playback works, for you. Edited by Doofus, 24 December 2017 - 01:35 PM. Thankyou for your interest. I would love to test it. But I'm away from home traveling for the next few months. You're implying that you get 10 bit HDR using this build? If yes, I would like to try. Don't know if you've looked in DSplayer on Kodi. 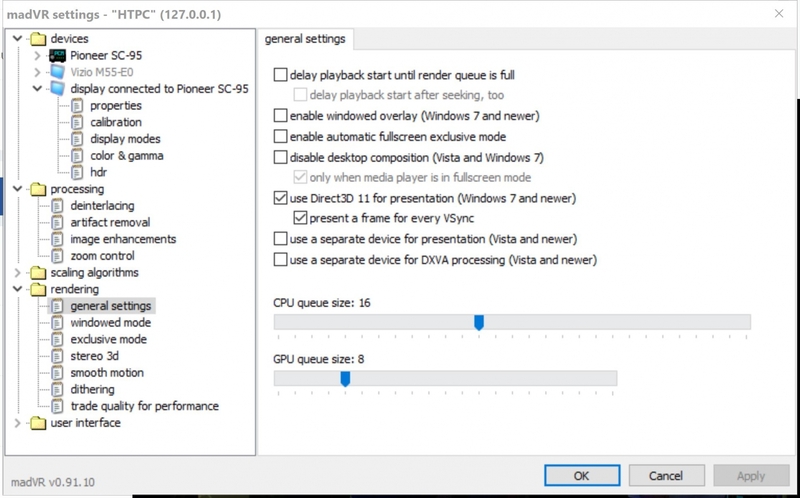 I have been looking for a long time DSPlayer's functionality (i.e. full MadVR support) and ET's interface in a Theater app. But hold off testing with what I've attached. Theater is soon getting an mpv update. Don't use D3D for HDR10. Depending on how it gets used, it could change to 8bit. The safest is auto copyback, for hardware acceleration. Edited by Doofus, 27 December 2017 - 03:49 PM. Luke, it might be a good idea to have a note to advise against using D3D11 for 10bit. I'll have to look to see if mpv says not to use other HWA for 10bit. Auto copyback appears to be the most safe. It can be used with almost anything. Edited by Doofus, 27 December 2017 - 07:10 PM. "d3d11va is safe when used with the d3d11 backend. If used with angle is it usually safe, except that 10 bit input (HEVC main 10 profiles) will be rounded down to 8 bits, which will result in reduced quality. Also note that with very old ANGLE builds (without EGL_KHR_stream path,) all input will be converted to RGB."